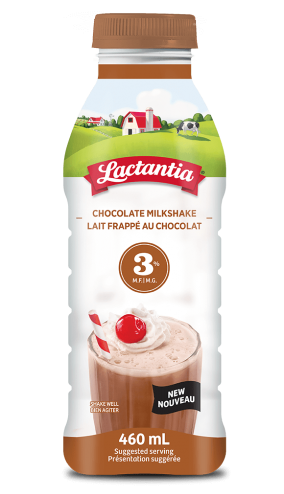 Shake it up with Lactantia® Milkshakes! Enjoy all the benefits of regular milk while satisfying that sweet tooth. Lactantia® Milkshakes offer the best of milk – it’s a little indulgence that can be enjoyed anywhere, anytime. Contains Calcium and Vitamin A. 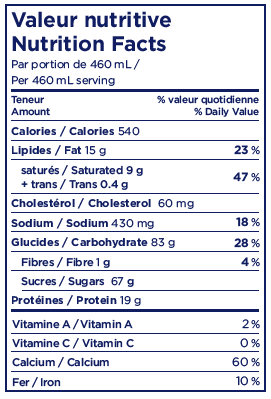 Modified Milk Ingredients, Sugar/Glucose-Fructose, Cocoa, Salt, Carrageenan, Guar Gum, Locust Bean Gum, Sodium Phosphate, Natural and Artificial Flavour.